The game begins like any other Mainstream Pokemon Game with the Professor of the Region introducing themselves to you and getting your trainer's basic information. However, this game begins with a bit of a twist: the namesake Starter Partner Pokemon, Eevee, will actually jump out of a TV and pull the player straight into the game. After it does, Professor Oak, the professor of the Kanto Region, will then appear and introduce himself. From there, he will ask you what your trainer's gender and name is, as well as the name of your Rival Character (who is actually the friend you have grown up with in Pallet Town). After this information has been given, your trainer will wake up in their house in Pallet Town. By heading downstairs, you will meet your mother. She will remind you that you are to go to the Pokemon Lab to meet with Professor Oak and your Rival, since today is the day Oak will be giving the two of you your very first Pokemon (at the wishes of your Rival). By heading to the Lab across the small town, you will find your Rival inside and learn from him that Professor Oak is not there. He notices two Poke Balls on the shelf nearby, and he wonders if those are the Pokemon the two of you will be receiving. But without Oak being present, there is no way of telling. Since Oak isn't there, you will need to go on the search for the Professor. By leaving the Lab and heading to the northern part of the town towards Route 1, you will find Professor Oak helping out some Pidgey. The two of you will officially meet after that, and Oak will suggest heading to the Lab to collect your Starter Pokemon. However, just then, an Eevee will come running up through the Wild Grass. It will run into your trainer, and you will immediately go into battle with it. Since this is your first every Pokemon Encounter, Oak will suggest attempting to catch the Eevee for practice. After catching the Eevee, it will begin jumping within its Poke Ball. Suddenly, it, while yet still in the Poke Ball, will head towards the Lab. Your trainer and Oak will Follow it straight to the Lab, and you will eventually find it with the other two Poke Balls on the shelf. Your Rival is confused as to why there are now three Poke Balls, and Oak will suggest you go get control of the Poke Ball with Eevee inside as it continues to bounce. Right as you attempt to grab the Poke Ball, Eevee will burst out and you will make physical contact with it. The two of you will instantly connect, and then Eevee will become your Pokemon. After officially obtaining and naming your Starter Partner Pokemon (if you chose to nickname it), your Rival will receive their Starter Pokemon, which will be Pikachu by default. 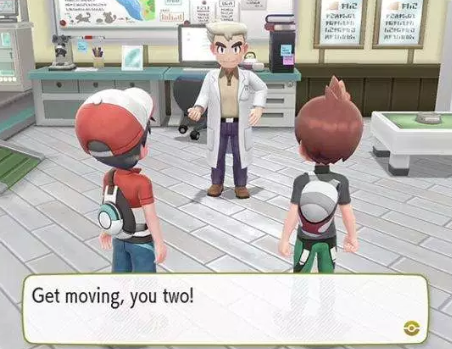 Before leaving the Lab, Oak will assign you and your Rival an additional project. He will give each of you a Pokedex, which collects the data of every single Pokemon in the wild. Your goal, while traveling through the Kanto Region, will be to find and catch every single Pokemon within the region. With this piece of equipment, your Rival will be off and you will quickly Follow after. Outside the Lab, you will run into your mother. She will be both sad and glad to see you begin your adventure, giving you a Town Map as a parting gift. Wondering what Pokemon you should use on your journey? Check out our What Is The Best Pokemon Team Page for our recommendations!